Who do you think wins the debate? Check their arguments/comments and suggestion and decide who deserves to win this week. 24 hours voting window period. I am MKH. I am new here and want to help peoples by my services. 4. Community increasing for Telegram + others social platforms. 6. Full ICO package including marketing. I have a growth hacker in my team, so its pretty easy for me to provide this service to anyone. 10. Full smart contract development and auditing service. 5. Post in this service thread. This article is designed to give tips to readers about how they can improve or augment actions in their life to have a healthy lifestyle; it is not meant to be all inclusive but will include major components that are considered to be parts of a lifestyle that lead to good health. In addition to the tips about what people should do for healthy living, the article will mention some of the tips about avoiding actions (the don'ts) that lead to unhealthy living. "Healthy living" to most people means both physical and mental health are in balance or functioning well together in a person. In many instances, physical and mental health are closely linked, so that a change (good or bad) in one directly affects the other. Consequently, some of the tips will include suggestions for emotional and mental "healthy living." All humans have to eat food for growth and maintenance of a healthy body, but we humans have different requirements as infants, children (kids), teenagers, young adults, adults, and seniors. For example, infants may require feeding every four hours until they gradually age and begin to take in more solid foods. Eventually they develop into the more normal pattern of eating three times per day as young kids. However, as most parents know, kids, teenagers, and young adults often snack between meals. Snacking is often not limited to these age groups because adults and seniors often do the same. The bulk of food consumption should consist of fruits, vegetables, whole grains, and fat-free or low-fat milk products.Choose lean meats, poultry, fish, beans, eggs, and nuts (with emphasis on beans and nuts). Control portion sizes; eat the smallest portion that can satisfy hunger and then stop eating.Snacks are OK in moderation and should consist of items like fruit, whole grains, or nuts to satisfy hunger and not cause excessive weight gain. Avoid sodas and sugar-enhanced drinks because of the excessive calories in the sodas and sugardrinks; diet drinks may not be a good choice as they make some people hungrier and increase food consumption. Avoid eating a large meal before sleeping to decrease gastroesophageal reflux and weight gain.If a person is angry or depressed, eating will not solve these situations and may make the underlying problems worse. Avoid heavy meals in the summer months, especially during hot days.A vegetarian lifestyle has been promoted for a healthy lifestyle and weight loss; vegetarians should check with their physicians to be sure they are getting enough vitamins, minerals, and iron in their food.Cooking foods (above 165 F) destroys most harmful bacteria and other pathogens; if you choose to eat uncooked foods like fruits or vegetables, they should be thoroughly washed with running treated (safe to drink) tap water right before eating. People with diabetes should use the above tips and monitor their glucose levels as directed; try to keep the daily blood glucose levels as close to normal as possible.People with unusual work schedules (night shifts, college students, military) should try to adhere to a breakfast, lunch, and dinner routine with minimal snacking.People who prepare food should avoid using grease or frying foods in grease.People trying to lose weight (body fat) should avoid all fatty and sugary foods and eat mainly vegetables, fruits, and nuts and markedly reduce his/her intake of meat and dairy products.Seek medical advice early if you cannot control your weight, food intake, or if you have diabetes and cannot control your blood glucose levels. If your child is ready to stay home alone, here are some rules to keep your child safe. When is your child old enough to stay home alone after school? It totally depends. Only you can properly assess your child's maturity, judgment, and comfort level. Your city or state may have laws governing the age at which kids can legally be left alone (often it's 11 and up), so be sure to check into that before you make a decision. Inspect your home thoroughly for any safety risks. Make sure that all of the smoke detectors are functioning properly. Even if you believe it to be common sense, review the sound of the alarm — and what to do if it goes off — with your child. She should get out of the house immediately and then call 911 from a neighbor's house. Review the emergency exits by drawing a map that outlines the best pathways to safety from each room in the house. Post relevant phone numbers (911, a close neighbor, your cell and work numbers) prominently. Make it a rule that your child calls a parent (or other adult that you designate), or leaves you a message, as soon as he gets home. This can be the first step in a daily routine that includes homework, a snack, and some downtime. Make the phone (almost) off-limits. Your child shouldn't answer the phone for just anyone, so set up guidelines. If you have a land line with caller ID, tell her not to answer the phone if she doesn't recognize the name or number. If you don't have caller ID, tell him that she should let every call go to voice mail. If you child is old enough to have her own cell phone, use the same guidelines. Your child should not leave the house unattended unless he's cleared it with you first or there is an emergency such as a fire. Make sure that he is aware of the risks of leaving home. Take the same way home. Have her take the same route to and from school every day. If your child walks, review each street that she uses. If she takes a school bus, make sure that she takes it every day, even if she is offered a ride from a friend. Knowing her route allows you to predict how long it will take her to arrive home, and to trace her steps if there is ever a problem. Although he needs some downtime to rest and rejuvenate, your child will be less likely to get into­ trouble if he's occupied with homework, music practice, and chores. Keep a first aid kit handy and review it with your child. Help her distinguish between a true emergency and a minor one that she can handle herself. With mobile wallet, it's hard to for hackers to access it, cuz you are the only one who generated and know it. It is not stored to servers but its decentrally only in the wallet and you only know it. of all thanks to be with Taucoin. Tau Coin is one of the Best Rising Crypto currency right now. We have opened a Telegram Group for the purpose of making it easier to buy / purchase Tau coin at a higher level and where you can sell your Coin. 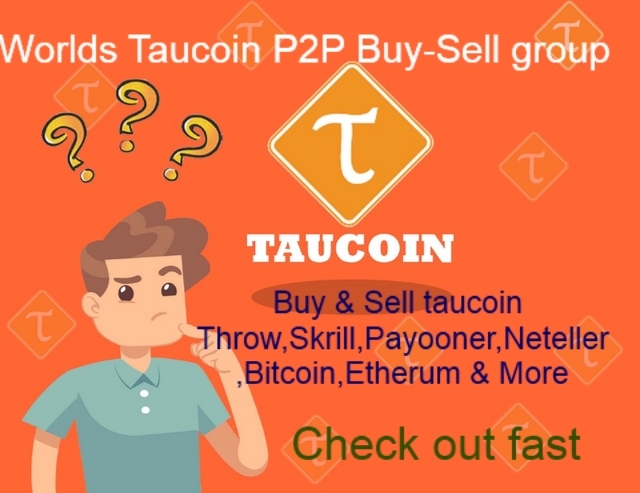 We are always wants to give you best Tau coin p2p services. You can safely buy the merchandise through Admin . We are with you in any assistance. To join our group, please follow the link below. which provide fair, secure and free Escrow services to all TAU Buy/Sell deal. Join us deal safely Thanks.